If you require colour matching to Pantone Colours on fabric then pease supply the original CorelDraw file. For best result we may need to be able to change the colours in the file. If your document contains a mixture of RGB and CMYK colours do not supply an EPS or Print to a PDF file as all RGB colours will be converted to CMYK. Please supply the original file and allow us to flatten the file. If your document only contains CMYK colours and images, with no transparency or effects then you can supply a PDF file. Do not use the Publish to PDF option from CoreDraw or use any other PDF creation software other than Adobe Acrobat. The only way to guarantee that a PDF file will print correctly is to Print your document though the Adobe Acrobat Printer Driver. If you do not have Acrobat then we recommend supplying the original file. 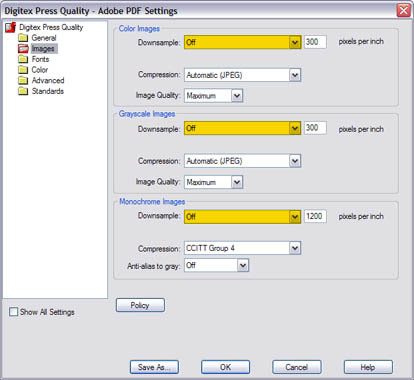 Use the [Press Quality] job options when creating the PDF file.To ensure that images do not get down sampled to a lower resolution we recommend changing the [Press Quality] job options and disable image down sampling. This may make the PDF file larger but at least it will eliminate the change of loosing image quality for scaled artwork.